(VANKLEEK HILL, ON – APR. 3, 2019)FOR IMMEDIATE RELEASE– Beau’s Brewing Co. is refining its core line-up of year-round beers, all to be sold in 473 ml tall cans. Joining the award-winning Lug Tread Lagered Ale and popular Full Time I.P.A. in the core line-up are two new recipes: Good Time Session I.P.A. and Beau’s Grapefruit Radler. 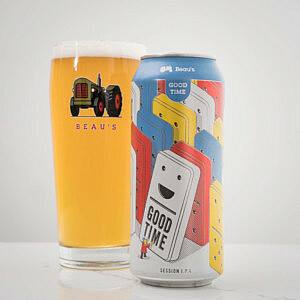 A seasonal, Helles Lager, rounds out the summer 2019 offerings from Beau’s. ·Good Time I.P.A. is Beau’s newly announced certified organic 4% ABV session I.P.A. made with Centennial and Nelson-Sauvin hops, available now in 473 ml tall cans. ·Beau’s Grapefruit Radler is a 100% certified organic blend of beer and fruit juices, and clocks in at an easy-to-enjoy 2.5% ABV. It will be available in mid-May in 473 ml tall cans. ·Helles is a certified organic classic golden lager; crisp, smooth and refreshing. Clean and uncomplicated, this 5% ABV lager will be available in mid-May in 473 ml tall cans.